A non-medicated bolus for use as an antiseptic and proteolytic aid in infection sites and wounds. 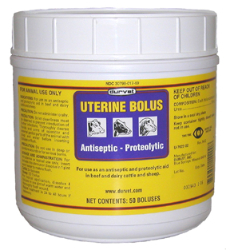 Boluses may be used as is for intra-uterine application or dissolved in water for flushing open wounds in beef and dairy cattle and sheep. For use on beef and dairy cattle, and sheep. Antiseptic Aid - helps inhibit and control bacterial growth at infection sites. Proteolytic Aid - helps reduce tissue proteins to more soluble forms. Flexible Use - ready to use as boluses or for flush Convenient Dosage – pre-measured boluses for easy, convenient dosing levels. For topical application, dissolve 4 boluses in one pint of warm water and thoroughly flush wound. Repeat treatment in 24 to 48 hours if necessary.